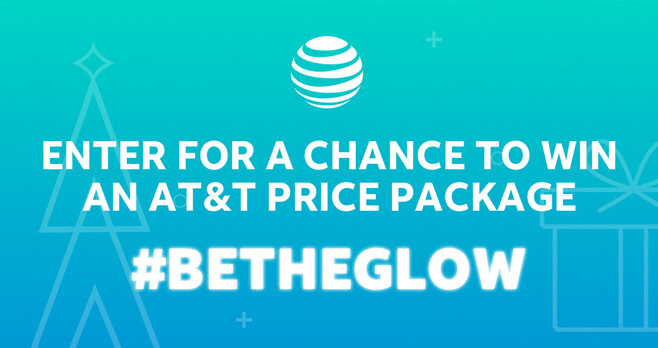 In December, go to attbetheglow.com and enter the AT&T Season of Glow Sweepstakes for your chance to win a $2,500 AT&T Tech Package for the holidays. Enter daily through December 30, 2017 for more chances to win. Who Can Enter? The AT&T Season of Glow Sweepstakes is open only to U.S. citizens and U.S. resident aliens who are physically located in and legal residents of one of the 50 United States or the District of Columbia, and who are at least the age of majority in their state of residence at the time of entry 18 years of age in most states except 19 in Alabama and Nebraska, and 21 in Mississippi. When To Enter? Sweepstakes begins on December 1, 2017 at 12:00am EST and ends on December 30, 2017 at 11:59pm EST. What Is The Season of Glow Sweepstakes Prize? The Grand Prize consists of an AT&T Tech Package. Who Are The AT&T Sweepstakes Winners? For the names of the Winner, send a self-addressed stamped return envelope to: AT&T Season of Glow Sweepstakes Winner, 606 Post Road East #693, Westport, CT 06880.